While Hawaii has thousands of years of history, it has only been part of the United States since 1959. It is the eighth smallest state by land area and the eleventh smallest state by population. While many people dream about living in Hawaii after they return from a honeymoon or vacation, it’s not an easy state to get to. A flight typically takes six hours or more, while the logistics of shipping furniture is complicated and expensive. This is why few moving dreams become realities. Hawaii’s population size is also the reason it only has one area code (808), which isn’t expected to be exhausted until 2029. The 808 area code covers all five counties in Hawaii: Honolulu, Kauai, Maui, Kalawao, and Hawaii County over eight islands. While the islands are small, the total area that they cover isn’t. In fact, Hawaii makes up hundreds of islands spread over 1,500 miles. If that were a straight line, you could drive from Miami all the way to New Hampshire! It also covers a few atolls (unorganized, unincorporated territories of the United States) located off the coast of Hawaii in the Pacific Ocean. This certainly makes it one of the most tropical and diverse area codes in America. 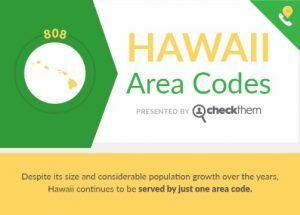 To learn more about this fascinating area code and the state of Hawaii, check out the infographic below by Check Them to learn more about who is calling you from this area code. Hawaii isn’t expected to need relief for the 808 area code anytime soon, which means the information you collect is likely to stay relevant for years to come.